COLARIS AP ® detects mutations in the APC and MYH genes, which cause adenomatous polyposis colon cancer syndromes, including familial adenomatous polyposis (FAP), attenuated FAP (AFAP) and MYH -associated polyposis (MAP). The most common adenomatous polyposis conditions are thought to account for approximately two percent of all colon cancer. COLARIS AP ® uses a simple blood or oral rinse sample to determine if patients have an APC or MYH mutation. Knowing the results may help patients and their healthcare providers act before cancer has a chance to develop. 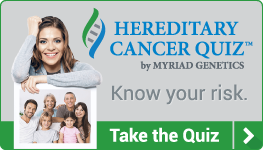 Myriad has developed a Hereditary Cancer Quiz that patients and their healthcare providers can use to help identify potential candidates for genetic testing with COLARIS AP ®. Differentiate between AFAP, MAP and Lynch syndrome. If a COLARIS AP ® test result confirms the presence of adenomatous polyposis syndromes, the following medical management options may help reduce or even eliminate the risk of cancer. For patients who have MAP, medical society management recommendations include colonoscopies every one to two years starting at age 25-30, upper endoscopies every three to five years starting at age 30-35, and surgical options. The most appropriate medical management will vary based upon the patient’s clinical presentation. For MYH mutation carriers (one mutation), medical management should be determined by clinical findings and a personal and family history of colorectal polyps and/or cancer. Current data are limited but suggest that any increase in risk, if present, is likely to be small. For more healthcare professional information or to order a COLARIS AP ® test kit, please visit MyriadPro.com. 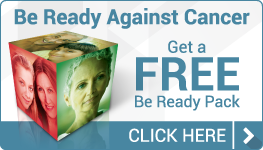 Myriad myRisk Hereditary Cancer evaluates 25 clinically actionable genes associated with eight cancer sites. Find out more about Lynch syndrome, the most common hereditary cause of colon and endometrial cancers.